The last few days we have been working on some of the details on the underside of the top. I mentioned in the last post that we added the support beams and wire chases and started glassing them into the top. That work was completed yesterday. We used the 1708 fabric to create a good structural fiberglass skin and tabs to secure the new structure to the top and distribute weight. Where there are tight corners and other places where the 1708 wouldn't conform to the surfaces, multiple layers of chopped strand mat were used. As a result, except for the edges, the structural glass is complete. Next on the agenda was to work on the detail around the side and front edges of the top. For this, the plan was to take 1 inch thin wall (schedule 20) PVC pipe, split it down the middle lengthwise, and glue it on the top and bottom of the edge to create an oval shape around the edge. The PVC would then be glassed over to create a convenient hand-hold. A slit would be cut along the bottom to accept the bolt rope for panels of a dodger (enclosure) set. Unfortunately, I found that the split PVC would not bend around the front curve as I had hoped it would. Guided by the suggestion of a few blog readers, I tried using heat to bend the pipe and that allowed me to reshape the PVC. I tried to create a template or jig to help make a uniform curve by hammering a bunch of nails into a board along a curve. Unfortunately I found another issue with this approach. While the curve appears fine to the eye, it is not a constant curve in two-dimensional space (remember it was drawn along the curve of the arch using my string-compass technique). This means a jig that replicates a curve segment won't work for the entire curve. Best guess now is that I may have to slowly curve it by hand until it is "close enough" and then use clamps to hold it in place while the glue dries. And that brings us to today. A storm that was predicted for this weekend seems to have arrived. It includes high winds and rain and makes work in a tent made of tarps assembled in a boatyard almost impossible. So, instead of working directly on the top, today was spent doing some shopping. We went looking for a paint sprayer I can use to apply PVA once the gel coat non-skid texture is applied to the finish. We also went looking for a new baking sheet for our propane oven after figuring out that a pizza we had wouldn't fit directly on the rack in the tiny oven (the oven box is only 11.75 inches deep by 17 inches wide). I also needed a new pair of sandals as my current ones were starting to fall apart. So, getting some things done...but just not a lot of progress on the top right now. The weather is supposed to be a bit touch and go for the upcoming week, so it will be interesting to see how much we can accomplish. I have to say I'm more than just a bit anxious to get moving again, so I find all of these weather delays a bit annoying. On the bright side, some friends are supposed to be coming for a visit soon and we have been forced to take a few breaks and be more social...which have been good things. In an unrelated note, I saw this while shopping today. Is it just me or is Kohl's jumping the gun a bit on the Christmas shopping season? 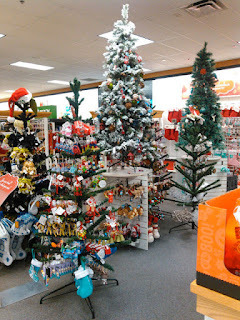 I was in a Walmart garden center yesterday to find all of the beach chairs were gone and replaced by Christmas stuff! They also jumped the gun as you say, and it seems to get earlier every year. I can't wait to sail off into the sunset myself later this year. If you want the best pizza, put either a pizza stone or unglazed, lead-free terra cotta tile on the bottom of your oven and then put the pizza on parchment paper directly on the stone. Best ever crispy crust. Maybe I'll make you some when we get there. Should see you tomorrow. I've been wanting to put a stone or other "heat distribution help" device in the oven...just haven't found one and it hasn't made it that high on the priority list...yet. :) Looking forward to seeing you guys, have a safe trip. Looked at weather forecast for your area. Boy you must be doing work inbetween raindrops and gusts of wind. Hope the tropical storm turns north and east soon. At least it's cooler. Did your plan for front handhold/rope channel with PVC finally work? Perhaps the rain allows for time to plan and order stuff for your other projects . Funny you should mention that...was just chased out of the yard by the rain. I hope it turns away, but who knows. Yes, the PVC worked out...need to write things up still...looks like I might have some time to do that now.